La Traviata is often cited as a progressive development in opera because it is concerned with portraying realistic stories of everyday people as opposed to mythical allegories that reflected the values and social position of the elite classes. 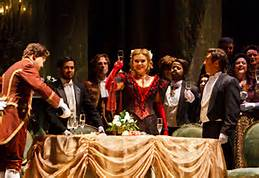 However, the realism of La Traviata is not necessarily concerned with reflecting lived reality, but with a realism that stretches theatrical conventions and fuses together tragedy and comedy in order to more closely resemble the conflicts and changes of the human condition. To this end, Richard Taruskin compares Verdi with Shakespeare and his tendency to mix together the profound and the worldly and use them as foils for each other. (Taruskin 576) The characters and situations become much less clear-cut as a result, and are often steeped in tragic ironies. We can see this in the final act of La Traviata in which Violetta is awaiting death in her apartment while Carnival revelers sing outside, or basically the entirety of Rigoletto from the excruciating plot twists to the choice of making the licentious Duke a tenor di forza, a “strong” tenor typically used as a romantic lead. Finally, La Traviata is one of the first (if not THE first) operas to attempt to stage its action in the present as opposed to a distant time and place, even if the Venetian censors pushed it back to around 1700. It is also worth noting that Verdi’s idea of producing an opera from a play that had only come out the previous year (and was actually being performed in Venice around the same time) might smack of simple opportunism were it not also a radical departure from the norm. La Traviata is additionally a product of the growing emphasis on the individual during the first half of the 19th century, beginning most spectacularly with the French Revolution. The opera was written in the aftermath of the 1848 revolutions that convulsed the continent, each with its own agenda but all maintaining a general focus on democratic reforms and suffrage, consolidating national identities, and empowering the middle and working classes. Of course, these goals posed existential threats to the entrenched hereditary autocracies of Europe, and the aristocrats managed to beat back most of the reforms within a few years. In spite of the disappointments, the demands of the lower classes to be recognized perhaps becomes reflected in artistic subject matter that begins to humanize the lives of those at the margins. The fact that La Traviata attributes noble and redemptive qualities to a woman who is essentially a high-class prostitute would seem to reflect this ideal. Up to this point, the musical and dramatic languages of tragedy had typically been reserved for emperors, gods, mythical figures, and other upper-class characters. Lower-class characters were the backbone of comedies and opera buffa. Dignifying the lives of a courtesan or a hunchbacked jester, and also providing them with properly tragic endings, represents a small but significant break from dramatic tradition. (Dalhaus 61-62) Indeed, the idea that art and drama could extend to subjects and areas previously deemed unsuitable was gaining popularity. Of course, the other side of this coin was that in a post-revolutionary time, the censors in various Italian states were often quick to forbid anything that could incite unrest. Perhaps the most famous example from Verdi’s catalogue was the demotion and relocation of the French king in Victor Hugo’s Le roi s’amuse to a Mantuan duke in Rigoletto, but individual words or phrases were routinely changed depending on the censors in any given state. See Dr. Dorgan’s catalogue of “Naughty Words” from Il Trovatore for an idea of the full extent of minute changes censors might demand. Yet, however much the authorities wanted to avoid incendiary topics and rhetoric on the opera stage, the questions over the relationship between individuals and established social institutions and hierarchies remained vital concerns in many works. La Traviata, Rigoletto, and Il Trovatore are also all in some way concerned with marginality and focused on characters who are isolated from society in one way or another. The hunchbacked court jester Rigoletto is marked by his physical deformity, and he attempts to keep his daughter Gilda completely secluded from the court. Azucena and the gypsies of Il Trovatore live isolated from court society, and the doomed Manrico is ultimately torn between the gypsies who raised him and his blood connection to the court of di Luna. By the third act of La Traviata, Violetta Valery has been shut off both from her former life of glamour and her domestic bliss with Alfredo. Even when we first meet Violetta she seems to recognize that she is ultimately disposable both to the wealthy patrons who enable her opulent lifestyle and to her entourage of friends and hangers-on. She would be abandoned and replaced as soon as she was unable to provide her services as a lover or hostess. Indeed, Giorgio Germont reminds her of this instability as he convinces her to give up her love for Alfredo, underscoring the fact that she would never be accepted in respectable society and its institutions. village, which used physical sequestration to solve the problem of social isolation. Their alienation from the townsfolk was also likely exacerbated by Verdi’s seeming disdain for the social niceties and obsequies to the village hierarchy that were expected of him in Busetto. In any case, drawing comparisons between Strepponi and Violetta Valery perhaps satisfies the facile desire to connect an artist’s works to particular events in his or her life, but provides little else and unnecessarily narrows our view of the work in question. In any case, Strepponi was financially and legally independent by the time she got involved with Verdi, even if her career was in decline, and she had never been a “kept woman” in any fashion. 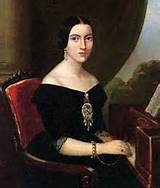 One might also imagine that, for all of the altruism and nobility Violetta displays, Verdi would not have been inclined to reflect his partner and future wife in a courtesan, especially while he is fighting for her social acceptance on some fronts. Strepponi also would certainly not have felt complimented by the comparison.